Tasty, addictive and popular drink served in Starbucks is a Starbucks original. Simply it’s a vanilla latte with a bit less vanilla and extra foam, and with caramel sauce drizzled on top. How to make such a sweet drink at home? To a coffee mug, add vanilla syrup and steamed milk. Top with milk foam and add freshly brewed espresso through the foam. Drizzle with caramel sauce. If you want to make this Starbucks clone super accurate, pick up bottles of the authentic vanilla syrup and caramel sauce sold in Starbucks stores. The shots of espresso need to be added after the steamed milk. 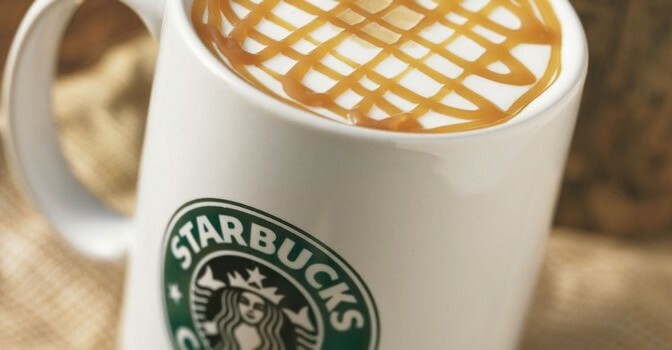 The actual recipe for the Grande Caramel Macchiato is 3 pumps vanilla syrup, add steamed milk with a bit of foam on the top, add double shot of espresso, and then make a criss-cross pattern on top of the foam with the caramel. uh, a grande caramel macchiato calls for 3 pumps of vanilla syrup… remember… a little less than the standard for vanilla lattes… duh! Try it iced with soy as a whole milk substitute, definitely my new favorite drink! Shea, coz I’m a Blue Rag looking for Crabs to blast at, damn girl my pistol be giving whiplash. starbucks coffiiee iis the best ever ii love iit not just because of the name but because iit iis awesome ii love iit!!! thats were me and friiends go when we go to the mall iits were ii go when iiam felliing down iits a wonderfull place a sanctuary iif u wiil, ii just love the relaxiing viiews of the people and the books and magaziines just layiing around for any open soul to piick up and read whiile they enjoy a deliiciious cup of hot or cold coffiiee. but that iisnt theiir only speciial thiing there iis also the scruptiious array of cakes, cookiies, muffiins and of course the many variietiies of breads to choose from. there are soooo many delectable flavors that there iis soo much to choose from weather ur haviing a calmiing breakfast or lunch wiith all of ur pals, ur always haviing a great fantastiic tiime a starbucks! the the most wonderfull place to hang out and just be yourself wiith all of ur friiends or wiith yourself and have the perfect driink…..or snack of ur oun choosiing. I still keep trying to make this wonderful caramel macchiato at home. The thing that still doesn’t work ist the caramel-topping with the original starbucks drizzle sauce. Everytime I put it on top of the steamed milk the steamed milk is ruined and the sauce sinks into the coffee but doesn’t make this yummy topping. Du you have to warm the sauce up? What is the secret behind this sauce? Making sure you foam is ‘tight’ and silky is one key, so making the foam slowly will create that, the other key is very thin drizzles of the caramel sauce. Why not go to Starbucks and get the original drink instead of suffering through all of this burning the milk and not tasting right blah blah blah. just pay the $4 and enjoy a drink made 10x better than you could make it yourself. or you could save the $4 and use what you have at home and make a homemade version. what are the best flavored coffee beans/grinds to buy for this? I use french roast, prefer the darker richer taste. Authentically you would use an espresso roast. i think this is for a HOT macchiato…how do you make an iced one? Iced Caramel Macchiato is the same exact recipe as above, just don’t steam the milk. How much milk for an iced venti caramel macchiato? My girlfriend always orders us an upside-down version. How is this made then? It is my favorite drink BTW. I think I am addicted!!! up-side down means the layers are added in reverse order from the recipe. I love them this way! Thanks for all of the recipe advice! Does anyone know where you can buy one of the Caramel Macchiato sets? Starbucks has them during the holidays to purchase as gifts but now I can’t find them anywhere. Please help! I am so addicted too!!! This is the best coffee drink ever! Those of you freaking out because he may or may not have made an error really need to chill out and get a life. It’s coffee. Go outside and take a breath of fresh air. Geez. I love them any way they come, hot, cold and upside down. This is my all time fav. I’m a diabetic but I absolutely love this drink. Is there a way to make this sugar free other than the obvious ditching of the caramel? AND have it actually taste good? woooow. chill. its a drink. Dagguah- they are really easy to make. to avoid scorching the milk, heat it to about 140 degrees instead of 165. I just made one for the first time and someone who drinks a lot of them was my test subject. she said it was the best she has ever had. try try again. 🙂 good luck. I run the espresso stand at our church and I’m looking for a good Caramel Macchiato recipe. This is a popular drink and I always dread it when people order it because I’m afraid I’m not making it right. The Syrups that Starbucks use are from Dolce. They are the best tasting. Diabetic coffee lover – you can use a sugar-free vanilla flavoring. It doesn’t taste any different in the drink to me. You fools, anything made at home is better than starbucks. Now now people I’m not hating on starbucks. It is definitely cheaper to make this drink at home than going to pay 10 dollars at starbucks every time you want one. Coffee beans: 10-12 dollars at best, and it will make you lots and lots of espresso shots. Syrup: Free for me, for you might be somewhere near 5 dollars? Caramel drizzle: Free for me, for you somewhere near 5 dollars? (I’ve never looked this up I’m just going by gut feeling). Now you are probably thinking what about the espresso machine? I managed to get a very decent espresso machine at an affordable price on the internet, about 80 dollars. Now considering that starbucks charges 10 dollars for the tall, 12 dollars for the grande, and 15 dollars for the venti, and about 20 dollars for the trenta, just buying less than 10 drinks at starbucks will get you this drink home made, for as long as you want. Don’t want it hot everytime? Add some ice cubes and some ice cold milk and you got yourself an iced macchiato. Want it blended? trow your ice cubes on a blender and add everything else to it and you got yourself a macchiato frap. All made at home. Thank you! Please, no one answered the question about how much milk is needed for each size. Since the milk has to be added before the expresso, there must be an exact amount. 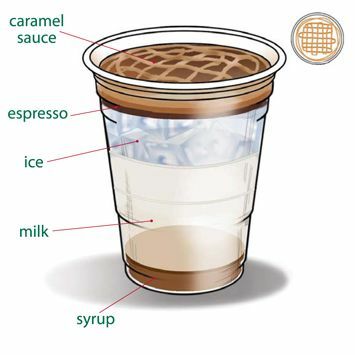 which caramel syrup do you use at Starbucks? I want to purchase it and need the exact name of the syrup for the bottom and also for the topping. So how would you make this iced? A macchiato is not suppose to be stirred… Correct? With as much milk as Starbucks uses for this drink the proper name should be Caramel Latte Macchiato. A true Macchiato (italian) is espresso shot with just a splash of steamed milk and is called a Cafe Macchiato. The focus is on the coffee. With a Latte Macchiato the focus is on the milk. I make the ghetto version since I have yet to get an espresso machine… I brew a very strong pot of coffee in my coffee maker. I use one scoop of vanilla ice cream in the cup of coffee to create a steamed milk froth. Then I add a drop of whole milk and some caramel drizzle. It’s very similar and just as satisfying! Vanilla Syrup? i thought it was caramal syrup? and how do you measure out pumps if you’re not using their exact bottle and pumps? the sauce on top is caramel sauce, it is not vanilla.. you do a basket weave. Iced CM is easy to make. Syrup goes in first, THEN ICE, then milk leaving room for espresso (if you get a venti at a Starbuck iced venti get 3 shots instead of 2) then caramel drizzle on top. CMs do not actually have caramel syrup as flavoring the only caramel in the drink is the drizzle on top, it gets vanilla syrup. Iced CM definately tastes better with soy milk if you like it sweeter! i like ds one 😀 one of my favorite flavor :D.
In any case of trying to imitate the original anything, remember that more of one thing makes you happy but, more of another might make others happy. Your mixture might not be the best but, if you keep practicing you will get it (once you do write it down)right so, you cannot ask how much of each ingredient you need for a perfect mix, containers dispense different increments. I use Kona coffee (vanilla mocha) mixed with caramel macchiato cream from Cosco. This mix is good enough for me. What’s up with Starbucks no longer having their Caramel Sauce (for the top of your Caramel Macchiato) ???? Does anyone have an answer or an identical substitute I can purchase? I even contacted Starbucks headquarters office and spent two hours on the phone contacting local stores with absolutely no luck and no answers from Starbucks as to why they are not offering their Caramel Sauce any longer on their Starbucks on line store. Hard to believe no one at Starbucks was able to provide any answers on the infamous “caramel sauce”. Since I live in the country and not close to a Starbucks, I have to make my own. Thank you anyone. What is wrong with people always assuming you can make iced drinks out of hot ones. You CANNOT make an Iced cappuccino(a cappuccino is half cup of foam! how can you ice foam??). Starbucks ruined coffee us out here in the upper north west HATE starbucks because we know what real coffee is. We know that to make a macchiato it’s not about vanilla or “less vanilla than a latte” It’s about less coffee than a latte(or as the person said before me cafe italian version is a tbs of milk). It is not “the same as a vanilla latte with less vanilla”. A macchiato is all milk with usually a shot of espresso and a very thin layer of foam. How do you ice foam? How can you possibly ice a drink that is named on how much foam goes in it? 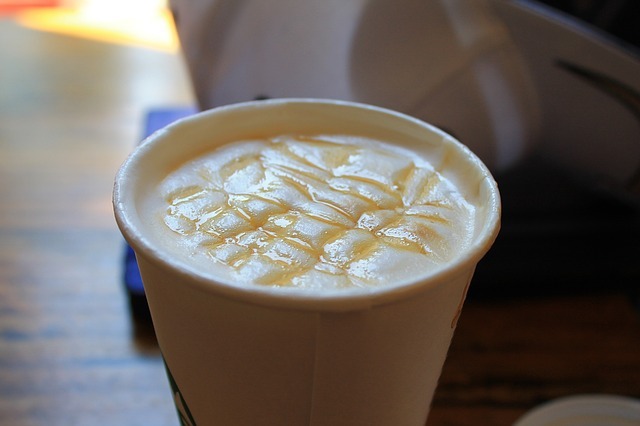 A latte as well is named for it’s 1 inch layer of foam in comparison to the cappucino’s half cup of foam. I’m sorry but when you ask for iced drinks it is simply espresso and milk over ice not an iced latte, iced macchiato, iced cappuccino. You are absolutely right, but it’s just to help keep it simple. (It’s easier to call it an ‘iced vanilla latte’ when it really does taste the same as the hot version) You’d be surprised at how dullwitted a lot of consumers are. The simpler, the better. @Norma Jean I love the iced version & had bought some Starbuck’s caramel last year. I was really dissappointed as it was too thick to poor. Perhaps my house is just too cold. Heating it helped some. But recently I picked up some Agave caramel at BJ’s Health food store. I can’t stand sugar free anything as. The artificial sweetener really turns me off. However, this stuff made from a natural ingredient is really good. And they say agave takes the body longer to process so it burns off more efficiently than sugar. I would give it a try. I bought th Organic Blue brand. I love this drink so much but i didn’t realizse it was so much syrup!! But thanks for the Caramel Macchiato tips! I love caramel macchiato and I drink one daily but not all baristas know how to make this drink correctly. Sometimes I get a Vanilla latte with caramel on the bottom of the cup. For the most part they are good about remaking it correctly but I had one barista tell me “you need to specify that you want foam on top”. I thought everyone received the same training but I guess it’s a hit and miss. This Caramel Macchiato is one of my favorite, although I do like most of the coffees and i love the steamed milk. Matter of fact I like all of your product. Yup, go out and buy one. Save your damn time. You can make a large Caramel Macchiato with 2 pumps of Amoretti vanilla blue agave nectar and 2 or 3 pumps of Amoretti Crema di Caramel syrup and your beverage will be diabetic friendly. Agave nectar has a glycemic index of 2 and will not spike your blood sugar level, and the Crema di Caramel syrup has 7g of carbs per pump for a total of eitehr 14 or 21g of carbs, depending on how much you decide to use. I use a teaspoon of Crema di Caramel to decorate the top of my macchiato. You can order both products at Amazon.com and get free supersaver shipping if you spend more than 25 bucks American. I dirnk one of these almost every morning. My 30 day average on my Accu-Check is 175 and my doctor said my A1C is excellent. Everyone stop!! Americans have (again) completely mangled the term Carmel Macchiato. Probably led by Starbucks. A macchiato has no syrup. It has a spot of cream on it. period. A carmel macchiato has no syrup. The carmel IS the espresso poured through the foamed milk. Period. Look it up. NOT at yahoo answers or Starbucks, but at an information site. Even Wikipedia will work.